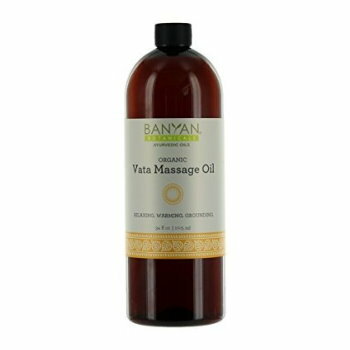 Vata Massage Oil: This naturally scented oil is a synergistic blend of 9 herbs, including ashwagandha, bala, passion flower and jasmine. Traditionally prepared in a base of organic sesame and olive oils, it warms and lubricates the delicate vata system, restoring calm and providing strength. Ingredients: Ashwagandha, Bala, Shatavari, Passion flower, Jatamansi, Bhringaraj, Licorice, Jasmine flowers, Tulsi. 34 oz.